For this example we show how to get a list of all child feature ids of a MoMa node. Lets assume our current MoMa tree looks like the following. And we have two feature classes like the following. 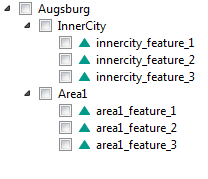 We want to get a list of the feature ids belonging to the node Augsburg. With the example above we can expect the return value as follows. (The order can be different).